Unpainted exterior walls are even more susceptible to penetrating damp than those coated in traditional masonry paints or renders. If your external walls are bare brick, natural stone, re-constituted stone or block work the chances are that wind-driven rain will at some point cause penetrating damp inside your home. Homeshield can solve this problem using a high performance masonry cream which helps repel water, keeping the surface dry and insulating the underlying wall. The masonry cream is roller or brush applied and initially appears white before it dries back totally clear, the benefit of this is that the contractor is able to see where has been coated and where hasn't thereby avoiding leaving any areas untreated. Improves the thermal efficiency of the masonry surface by keeping it dry. Maintains the thermal properties of cavity wall insulation. 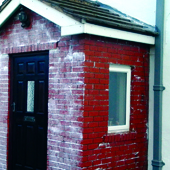 Tests have shown that a damp content of only 5% in a plain brick wall can lower the insulation value by up to 50%, especially where cavity wall insulation has been fitted. Chemically bonds to the surface and penetrates up to 17mm. Self cleaning surface retards the growth of moss or algae - keeps the walls clean. Allows the walls to breathe. Maintains the original masonry finish, no gloss or shine. Slows the ageing of the surface. Guaranteed for 10 years with expected life of 15-20 years. Or, fill in the form below and we will contact you as soon as possible.